Parents are the first and most important teachers of the faith for their children. What if we as the teachers/DREs/catechists find that the parents feel that they are ill-equipped, unprepared, or disinterested in passing on the faith to their kids? While encouraging parents to realize and accept the importance of sharing their faith with their children, I have found that often the kids are the ones who become the teachers. We can offer the parents Bible studies, faith formation, classes, videos, talks, etc., but attendance tends to be a low percentage of the same families. What will parents show up for? Seeing their kids perform or present. Knowing the parents will come and watch their kids shine, it is always a great idea to give opportunities for your students to share what they are learning with their families. This could be as simple as inviting the parents to come into the classroom for ten minutes, once a month, during which time the students give reports or show off new projects. Or it could be as elaborate as a planned program involving the whole school/all the CCD classes. Creating a presentation involving all of those students might sound intimidating, but it can be simple and still effective. Letting the students share what they know is not only a good practice that makes the objective of their learning real and practical, but it also enriches the knowledge and understanding of their families as a whole. The more the parents are involved in their faith, the more they thirst to know and serve Christ and His Church, the more that love will trickle down into their kids. 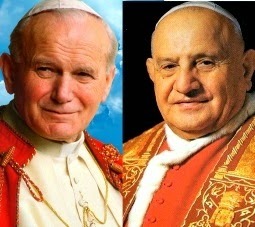 I would like to share with you one way that kids became the teachers through an awesome program celebrating the canonizations of John Paul II and John XXIII. My friend Paula, who works in a nearby parish, created this celebration for a group of students and families to mark the merging of a group of parishes. The parishes in the Kewanee, IL area joined under the new name of St. John Paul II this spring. You can see the adorable pictures from this celebration (including costume and set up ideas!) by clicking here. You can read about it in their parish bulletin here. Paula designed this program so that each student was involved and each grade level had a specific part in the presentation. All of the parts worked together and told the stories not only of St. John Paul II and St. John XXIII, but also about the things that they taught and about the canonization process overall. They covered some awesome information in interesting ways, and I know that more than the students learned from this program. The parents, grandparents, parishioners, and teachers who were in attendance were enriched and inspired by the stories of these holy men and the faith that they loved. Paula found most of her information online for the presentations about canonization, the Saint biographies, World Youth Day, the Luminous Mysteries, and Divine Mercy and turned them into useable reports/scripts for the kids to practice with and use. However, realizing that she wanted to share the stories of the miracles performed through the intercession of these great popes, Paula created two original plays for the students to perform. These stellar scripts, which she had written by Patrick Sloan, could be used as plays with costumes and an audience like you see in the pictures above, or you could use them in a classroom for a more simple readers' theater. Either way, they are well written, content rich, and available here for free. Paula was graciously willing to share the scripts so that more students (and maybe parents!) could learn from them. Click here for the play "The Miracle of Pope John Paul II." Click here for the play "The Healing Miracle of the Peasant Pope." Thank you Paula, for your great work with your students, and for sharing these plays with us! to become the teachers in their homes? You can find the links to other posts in my Happy the Home series at the bottom of my Sharing the Faith tab.